As a fan of his work on screen, I've got to say I was delighted to discover that I'm distantly related to Nicolas Cage. I've known for some time that his mother's maiden name was Vogelsang, and that made me always suspect a connection, as I'm a Vogelgesang descendant and that family had many descendants in America use the Vogelsang spelling. Vogelgesang, a surname meaning "dweller of where the bird's sing" (Vogelsang translates to "bird's song"), is not a common name to begin with and I soon learned that Cage's family goes back to Bavaria, Germany, as does mine. 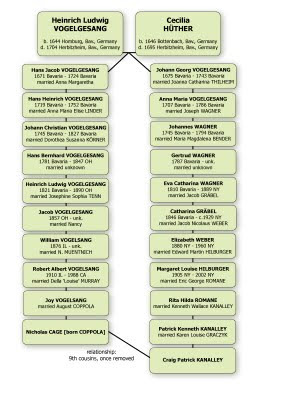 After in-depth research, I was able to trace his Vogelsang family from California to Illinois, and before that Ohio, linking directly to a branch of my family that settled there. Our common ancestors are Heinrich Ludwig Vogelgesang (1644-1704) and Cecelia Huether (1646-1695). He descends of their son Hans Jacob born 1671 and I come from their son Johann Georg born 1675.